In physics, angular velocity refers to how fast an object rotates or revolves relative to another point, i.e. how fast the angular position or orientation of an object changes with time. There are two types of angular velocity: orbital angular velocity and spin angular velocity. Spin angular velocity refers to how fast a rigid body rotates with respect to its centre of rotation. Orbital angular velocity refers to how fast a rigid body's centre of rotation revolves about a fixed origin, i.e. the time rate of change of its angular position relative to the origin. In general, angular velocity is measured in angle per unit time, radians per second in SI units, and is usually represented by the symbol omega (ω, sometimes Ω). By convention, positive angular velocity indicates counter-clockwise rotation, while negative is clockwise. In three dimensions, angular velocity is a pseudovector, with its magnitude measuring the rate at which an object rotates or revolves, and its direction pointing perpendicular to the instantaneous plane of rotation or angular displacement. The orientation of angular velocity is conventionally specified by the right-hand rule. 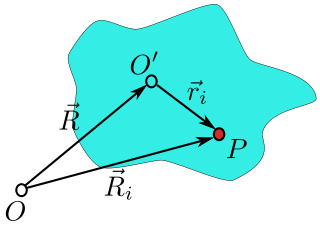 The angular velocity of the particle at P with respect to the origin O is determined by the perpendicular component of the velocity vector v.
perpendicular to the radius. When there is no radial component, the particle moves around the origin in a circle; but when there is no cross-radial component, it moves in a straight line from the origin. Since radial motion leaves the angle unchanged, only the cross-radial component of linear velocity contributes to angular velocity. 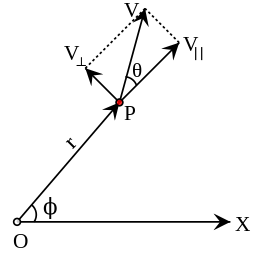 In two dimensions, angular velocity is a number with plus or minus sign indicating orientation, but not pointing in a direction. The sign is conventionally taken to be positive if the radius vector turns counter-clockwise, and negative if clockwise. Angular velocity then may be termed a pseudoscalar, a numerical quantity which changes sign under a parity inversion, such as inverting one axis or switching the two axes. The orbital angular velocity vector encodes the time rate of change of angular position, as well as the instantaneous plane of angular displacement. In this case (counter-clockwise circular motion) the vector points up. In three-dimensional space, we again have the position vector r of a moving particle. Here, orbital angular velocity is a pseudovector whose magnitude is the rate at which r sweeps out angle, and whose direction is perpendicular to the instantaneous plane in which r sweeps out angle (i.e. the plane spanned by r and v). However, as there are two directions perpendicular to any plane, an additional condition is necessary to uniquely specify the direction of the angular velocity; conventionally, the right-hand rule is used.
. This operation coincides with usual addition of vectors, and it gives angular velocity the algebraic structure of a true vector, rather than just a pseudo-vector. Notice that this also defines the substraction as the addition of a negative vector. Given a rotating frame of three unit coordinate vectors, all the three must have the same angular speed at each instant. In such a frame, each vector may be considered as a moving particle with constant scalar radius. The rotating frame appears in the context of rigid bodies, and special tools have been developed for it: the spin angular velocity may be described as a vector or equivalently as a tensor. 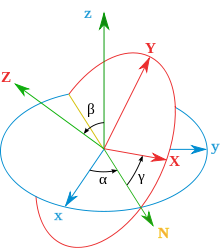 By Euler's rotation theorem, any rotating frame possesses an instantaneous axis of rotation, which is the direction of the angular velocity vector, and the magnitude of the angular velocity is consistent with the two-dimensional case. are unit vectors for the frame fixed in the moving body. This example has been made using the Z-X-Z convention for Euler angles. In general, the angular velocity in an n-dimensional space is the time derivative of the angular displacement tensor, which is a second rank skew-symmetric tensor. This tensor W will have n(n−1)/2 independent components, which is the dimension of the Lie algebra of the Lie group of rotations of an n-dimensional inner product space. which shows a connection with the Lie group of rotations. Thus, W is the negative of its transpose, which implies it is skew symmetric. Since the spin angular velocity tensor of a rigid body (in its rest frame) is a linear transformation that maps positions to velocities (within the rigid body), it can be regarded as a constant vector field. In particular, the spin angular velocity is a Killing vector field belonging to an element of the Lie algebra SO(3) of the 3-dimensional rotation group SO(3). Also, it can be shown that the spin angular velocity vector field is exactly half of the curl of the linear velocity vector field v(r) of the rigid body. Position of point P located in the rigid body (shown in blue). Ri is the position with respect to the lab frame, centered at O and ri is the position with respect to the rigid body frame, centered at O′. The origin of the rigid body frame is at vector position R from the lab frame. The same equations for the angular speed can be obtained reasoning over a rotating rigid body. Here is not assumed that the rigid body rotates around the origin. Instead, it can be supposed rotating around an arbitrary point that is moving with a linear velocity V(t) in each instant. 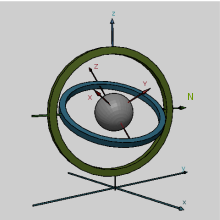 To obtain the equations, it is convenient to imagine a rigid body attached to the frames and consider a coordinate system that is fixed with respect to the rigid body. Then we will study the coordinate transformations between this coordinate and the fixed "laboratory" system. is the previous angular velocity tensor. It can be seen that the velocity of a point in a rigid body can be divided into two terms – the velocity of a reference point fixed in the rigid body plus the cross product term involving the orbital angular velocity of the particle with respect to the reference point. This angular velocity is what physicists call the "spin angular velocity" of the rigid body, as opposed to the orbital angular velocity of the reference point O′ about the origin O. If the reference point is the instantaneous axis of rotation the expression of the velocity of a point in the rigid body will have just the angular velocity term. This is because the velocity of the instantaneous axis of rotation is zero. An example of the instantaneous axis of rotation is the hinge of a door. Another example is the point of contact of a purely rolling spherical (or, more generally, convex) rigid body. ^ "online tool to calculate angular speed vectors". Aeroengineering.info. Retrieved 2013-01-23. ^ Rotations and Angular Momentum on the Classical Mechanics page of the website of John Baez, especially Questions 1 and 2. Symon, Keith (1971). Mechanics. Addison-Wesley, Reading, MA. ISBN 978-0-201-07392-8. Landau, L.D. ; Lifshitz, E.M. (1997). Mechanics. Butterworth-Heinemann. ISBN 978-0-7506-2896-9. Look up angular velocity in Wiktionary, the free dictionary. Wikimedia Commons has media related to Angular velocity. Pickering, Steve (2009). "ω Speed of Rotation [Angular Velocity]". Sixty Symbols. Brady Haran for the University of Nottingham.